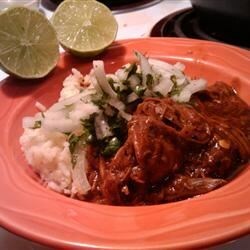 "An authentic Mexican dish - chicken slow cooked in a delectable sauce of chiles with a rich, never overpowering, chocolate background. Wonderful served with warm corn tortillas, rice and beans. Plan to have quite a mess to clean up afterward!" Remove the stems, veins and seeds from the chiles (you might want to wear gloves when you do this). Heat the lard in a heavy skillet over medium heat. Add the chiles, and cook and stir until the chiles are fragrant, about 1 minute, being careful not to burn them. Remove the chiles and place them in a large bowl. Stir in the onion and garlic, and cook until the onion is soft and translucent, about 5 minutes. Remove and add to the bowl with the chiles. Break the flour and corn tortillas into pieces, and add them to the skillet. Toast on both sides, turning often, until golden brown, about 3 minutes. Remove; add to the bowl. If needed, melt a small amount of additional lard in the skillet. Add the plantain pieces to the skillet, and cook and stir until lightly browned, about 5 minutes. Remove plantain; add to the bowl. Stir the almonds and peanuts into the skillet, and cook and stir until fragrant, about 1 minute. Sprinkle in the sesame seeds and continue cooking until sesame seeds are lightly browned, 15-30 seconds. Remove; add to the bowl. Working in small batches, puree the mixture in a blender until smooth, adding a small amount of water if needed to make a smooth sauce. Place the chicken into a large Dutch oven; pour the sauce over the chicken. Cover and simmer over medium low heat until the chicken falls off the bone, 2-3 hours. I made the recipes as stated it had a very strange bitter flavor. It was worth a shot but will not make again...sorry! I made this Mole for my boyfriends surprise birthday party. It was a hit everyone LOVED it. I think Im in good with my "in-laws"....Thanks .. This is fantastic. I added about 2 Tbsp sugar and a dash of cinnamon though, and it turned out to be very delicious. Thank you!